Make the filling: bring a large pot of salted water to a boil. Boil the potatoes until they’re soft but not mushy, about 15 minutes. Using a potato ricer (or masher), rice the potatoes while they’re still hot. Add the crème fraîche or fromage blanc and mix to combine. Add salt to taste. After the potatoes have cooled slightly, add the chives and mix the filling thoroughly. Cool the mixture in the refrigerator until ready to use. Make the dough: in a large bowl, whisk the egg. Mix the milk and sour cream into the egg. Add the sifted flour to the bowl a little at a time until a dough forms (note: you may need to add slightly more flour if the dough is too sticky). Knead the dough with your hands for 8 to 10 minutes until the dough is smooth and no longer sticky. Once the dough has come together, transfer it to a clean mixing bowl, cover with a kitchen towel, and let rest for 1 hour. Cut the rested dough into 4 equal pieces. Working with one piece of dough at a time (keeping the other pieces covered), roll out each piece into a 1/8-inch-thick round. Use a 3 1/2-inch circular cutter to cut the dough into rounds. To fill the pierogi, place 1 heaping tablespoon of filling directly in the center of a round. Fold the round in half. Pinch firmly around the outside edges of the dough to form a tight seal and force the air out of the pierogi. Bring a large pot of water to a boil. Add the pierogi and cook in batches for 3 minutes or until they float to the top. Drain the pierogi. 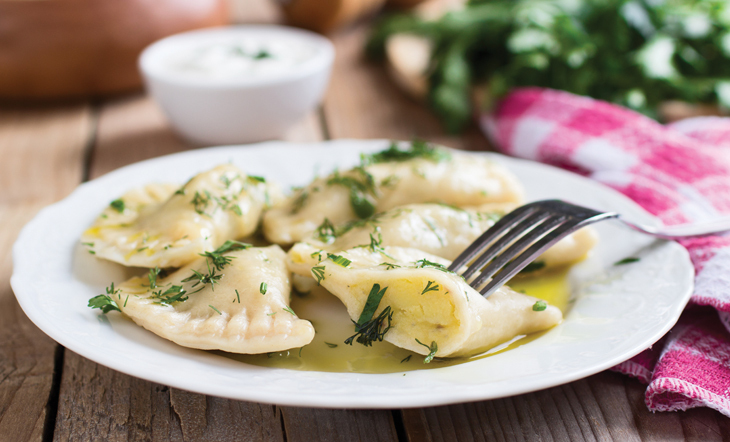 To serve, place the hot pierogi in a serving dish and top with a generous dollop of sour cream and chopped herbs.